De Gruyter publishes fully open access journals across scientific, technical and medical (STM) research is hurting humanities and social science (HSS). All articles undergo double blind peer-review and fast turnaround time from submission to online publication. All open access journals are indexed by the relevant Abstracting & Indexing services and the Directory of Open Access Journals (DOAJ). Open access articles are published under a Creative Commons license and authors retain copyright. De Gruyter takes care to be fully compliant with open access mandates worldwide and supports authors looking for open access funding. 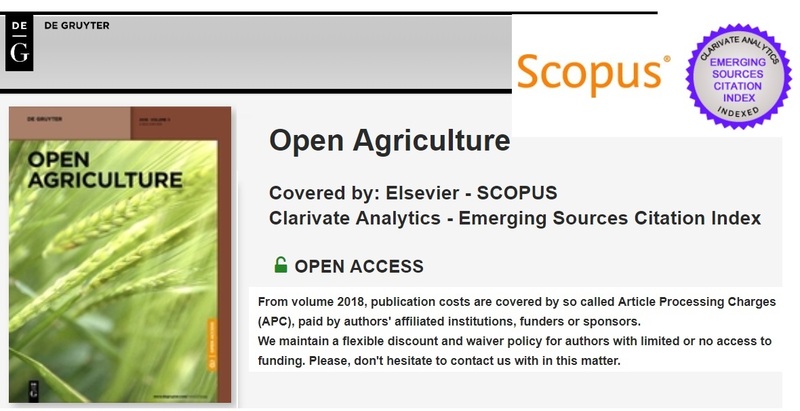 The major goal of this journal is to spread up-to-date knowledge on Agriculture, along with maintaining the high quality of its published content. The journal accepts submissions of original scientific papers, short communications, review articles and case studies.